A while back (January 3), I told about a player on a Valencian handball team who acted as interpreter for visiting British players. Now here’s a similar story about a wrestler. “A good friend of mine (Konrad) just won the ACC [Atlantic Coast Conference] Wrestling Championships for the second year in a row and it got me thinking. Konrad is from Poland and has wrestled for the Polish Olympic Team in years past. 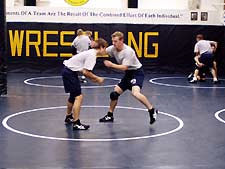 When I was a senior and Konrad was a freshman, he invited me to join him in Poland for a few weeks to train with his Olympic team. Anyway, the trip was great, I got tossed around by really tough Polish men, and I've never been so sore in my life. However, my inadequate wrestling skills are not the point of the story. Well, whether Konrad liked interpreting or not, he could and did do it. In the case of the pilota player, we know that he was an advanced Native Translator, a university student of English. We have less information about Konrad's translating background; but since the ACC is an organization for American college students, and also from the mention of senior and freshman, it's clear that Konrad had received at least part of his education in the United States. The article finishes with something about another kind of translation. This time it's intralingual translation within English. The author of the article has hit on something significant for translation theory: the similarity, or at least partial similarity, between translating between different languages and between registers in the same language. Rick Lindquist. Health insurance agents are paid translators of a foreign language. Clarifying Health, March 9, 2010. http://zanebenefits.com/blog/2010/03/214/Health+Insurance+Agents+are+Paid+Translators+of+a+Foreign+Language. I could say a lot about the recent development, because I spent six formative years working in a major MT project in Canada. However, this blog isn’t the place for it. Except for one aspect. Even the most enthusiastic promoters of MT, its designers and vendors, concede that it provides at most “80-90% effectiveness.” (In fact, the most important part of the BBC debate was translated by humans.) So it still has problems, and from the difficulties posed by those problems we can learn a lot of things about human translation. That's why my title embodies a reversal of the title of Alexander Ljudskanov’s book: see December 6 post. Many years ago, a young researcher named Martin Kay - he’s now the aging chairperson of the International Committee on Computational Linguistics - said one of the wisest and pithiest things ever on the topic: “The trouble with research on machine translation is that we don’t know enough about translation.” In this post, I want to point to one of the things we can learn. When humans translate, be they Natural or Expert Translators, they’re constantly monitoring what they’re producing. How do we know this? Because we can observe them correcting themselves. There are several aspects to their corrections, but the most important is correction of the meaning. In other words, translators are constantly asking themselves, “Does my translation mean the same as the original?” If not, and if they don’t give up altogether by skipping a segment, they try again. S lived in Italy until he was five years old. He learnt English from his English-speaking father and Italian from his Italian mother and the rest of his entourage. Deliberately, no one in the household asked him to translate, because they didn’t want him to mix his languages. So, at three years old, he was still a very natural Natural Translator when the following incident occurred. However, what a three-year-old child can do, MT systems can’t. They don’t have COMAL discrimination. So to judge whether the translation is correct as to meaning, it’s still necessary to have recourse to bilingual humans. And since the systems can’t by themselves know when they’ve made a translation mistake, they don’t correct themselves. Therefore, unless the MT output undergoes human revision, any errors of meaning are served up willy-nilly to users for them to cope with as best they can. W. J. Hutchins. Machine Translation: Past, Present and Future. Chichester: Ellis Horwood / New York: Halsted, 1986. Candace Séguinot. The translation process: an experimental study. In The Translation Process, Toronto: H. G. Publications, 1989, pp. 21-53. Walburga von Raffler Engel. The concept of sets in a bilingual child. In Actes du Xe Congrès International des Linguistes, vol. III, Bucharest, Romanian Academy Press, 1970, pp. 181-184. Brian Harris and Bianca Sherwood. Translating as an innate skill. In Language Interpretation and Communication, ed. D. Gerver and W. H. Sinaiko, Oxford and New York, Plenum, 1978, pp. 155-170. Digitized copy available without charge from translatology@yahoo.com. Last year, in response to an article by Daniel Pageon, I put up a couple of posts about Natural Translators in fiction (August 20 and September 6). Here’s another, and there’s a message with it. Last week we went to see the film Desert Flower. Amazing, unusual story, excellent acting and direction, and a moving message. Oscar-worthy in my view, but then - as my friend José-María Bravo always insists in his many writings about film translation - the cinema is above all an industry. How well will Desert Flower do at the box office? The version we saw was subtitled in Spanish. Subtitling excludes it from distribution to the mainline Spanish cinemas, which insist on dubbing. It’s the semi-fictionalized biography of Waris Dirie, a young Somali woman who flees to England from an arranged tribal marriage and after a hard beginning eventually becomes a top fashion model. If you can’t see the film, do read the book. But of course there are things in the film that aren’t in the book. What comes through most clearly in the film is the courage of the leading character and her condemnation of female genital mutilation. At one point she collapses in pain in London and a friend takes her to the nearest hospital. There she reluctantly submits to a gynaecological examination by a male doctor. The doctor, seeing that she’s been circumcised, tells her that she’s been stitched up too tight but that he can give her an operation to reduce the pain. Only she doesn’t understand his English. So he calls for an interpreter. But the hospital’s regular interpreter is away, so he says to fetch another hospital worker who speaks Somali. The worker comes, but instead of translating what the doctor is saying he tells Waris in Somali that she should be ashamed of having submitted to the examination and that she will be betraying her family, her tribe, her culture if she has the operation. She leaves in confusion, but she does go back for the operation later. The sequence illustrates dramatically the danger of using untrained interpreters in medical settings, though I doubt whether many filmgoers will perceive it that way. Yet it also illustrates how bilingual hospital staff are in fact pressed into service. Desert Flower, Spanish title Flor del Desierto. Adapted and directed by Sherry Horman. Germany, Austria and United Kingdom: Desert Flower Filmproductions, 2009. Waris Dirie and Cathleen Miller. Desert Flower: The Extraordinary Journey of a Desert Nomad. New York: William Morrow, 1998. José-María Bravo. Film translation research in Spain: the dubbing of Hollywood movies into Spanish. In Lexicography, Terminology and Translation: Text-based Studies in Honour of Ingrid Meyer, ed. Lynne Bowker, Ottawa, University of Ottawa Press, 2006. This is an appendage to my November 19 post about fixers, the local bilinguals, often Natural Translators, who serve as liaison interpreters to foreign journalists in conflict zones. Listening to a French journalist on TV 5 this week, I was jolted by hearing her use fixeur. It means the English term fixer has now been borrowed into French. At any rate for the time being, until the interventionist language authorities in France or Quebec wake up to it and try to impose something more native. It no doubt helped that French already had the verb fixer. But that doesn’t have among its meanings the mildly derisive one that fix has in the English fixer. I wonder what other languages have imported it. No post this past weekend because I couldn’t concentrate for the noise. It’s Fallas week in Valencia, the Spring festival when hundreds of pretty girls parade in mock-18th-century aristocratic costumes made of sumptuous brocades, and with golden adornments in their hair. Streets are bejewelled at night with arcades of coloured lights - a million bulbs in the largest of them - and giant comic, satirical effigies block some 150 street crossings throughout the town. At midnight on Friday, all the effigies will be burnt simultaneously, a year’s work by a guild of artists and artisans spiralling sky high in a city-wide bonfire said to symbolize disdain for worldly possessions. However, there’s another side to Fallas. Valencians love fireworks - so do I - but more than the colour of the fireworks they love the noise. I suspect they early on develop exceptionally strong eardrums. The mortar blasts each day at 2 pm in front of the City Hall reach 120 decibels and masses of children of all ages come from far and wide to experience them. Kids eight years old can buy firecrackers to let off in the street, and from 12 they can buy ones that really make passers-by jump. Since we live on the main square of a district of Valencia, we hear it all; the only let-up is when the children go to eat. Holy Week isn’t such a big deal in Valencia as it is in other parts of Spain. By then the Valencians have emptied their energy and their wallets for Fallas. There’s a terminology in Valencian for the traditions. Here’s a sample. Falla: a giant satirical effigy, accompanied by a smaller one for children, the falla infantil. 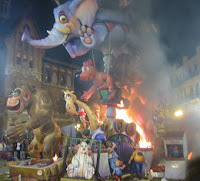 The plural in Valencian is Falles. Ninot: one of the smaller figures surrounding or attached to the main falla. 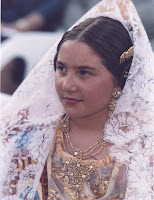 Fallera: a young woman who participates and who wears the costume. The queen of the falleres is the Fallera Major. Adreç: set of hair ornaments and costume jewellery worn by the falleres. There are terms for the other components of the costume, and there's a costume for men. Espolin: the silk brocade from which the richest dresses are made. It's still hand woven on 19th-century wooden looms. Casal: club house of the Fallas association of each district. Cridà (call): The inaugural speech by the Fallera Major calling on all Valencians to join the festivities. Plantà: the inauguration of the effigies. Cremà: the burning of the effigies. Mascletà: a long, deafening, orchestrated blast of firecrackers. Nit del foc (night of fire): a super fireworks display. Despertà (awakening): an early morning round of the streets by a group throwing loud firecrackers in all directions to rattle people from their sleep. Josep Lacreu et al. Salt3. Valencia: Generalitat Valenciana, Conselleria d’Educació, Servici d'Assessorament Lingüístic i Traducció, c2007. http://www.edu.gva.es/polin/val/salt/apolin_salt.htm. Although promoted for machine translation, this software includes an excellent dictionary of Valencian for humans and can be downloaded free. Marjorie Faulstich Orellana (see September 19 and November 1 posts) has sent me this heartwarming story. A bilingual 4th grader [11 years old] hurt in an Arizona bus accident that killed six people and injured more than a dozen others translated from an ambulance stretcher for busy rescue workers as they hurried to set up a triage center, authorities said Saturday. Oscar Rodriguez of Las Vegas, Nevada., was labeled a hero by firefighters and paramedics for helping them communicate with non-English speaking passengers just after Friday's pre-dawn crash on an interstate. They presented him with gifts and a certificate that reads "Hero of the day" during a visit with him at a Phoenix hospital Saturday. "This kid stayed calm and was brave more than any other veteran I've worked with," said Kenneth Leslie, a paramedic who, with his partner, was the first to arrive at the scene. The bus was traveling from the central Mexican state of Zacatecas to Los Angeles. Associated Press. Paramedics hail 'hero' boy from Arizona bus crash. USA Today, March 7, 2010. http://www.usatoday.com/news/nation/2010-03-07-arizona-accident-boy_N.htm#uslPageReturn. This is the last of my posts about the Shafia case for the time being. The preliminary hearing has finished. Now we have to await the trial itself, but don’t hold your breath - it isn’t expected to start until next year. I want to repeat what I said last time, namely that what I’m writing here casts no aspersion on the performance of the Shafia court interpreters, whose work hasn’t been challenged. There are some very good court interpreters in Ontario. • Complete a Canadian Police Information Centre criminal record check. 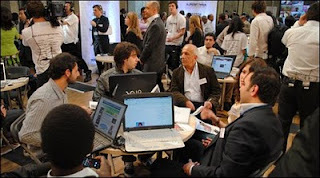 No educational, training or experience prerequisites, and subsequent training limited to a single seminar. Still, there is the Court Interpreter Test plus the exam in court procedure. I enquired and was told by the Coordinator at MAG that the Test is now administered in both consecutive and simultaneous. Curiously the ad makes no mention of the Certified Court Interpreter title that can be obtained through the Association of Translators and Interpreters of Ontario by passing a national court interpreter examination, even though the title is protected by Ontario law. Well, perhaps there aren’t any nationally certified interpreters available for Farsi/Dari anyway. Superior Court Justice Hill made a close and detailed examination in R. v. Sidhu which revealed a slew of problems with the system of accrediting and assigning court interpreters in Ontario. One of the witnesses in Sidhu was Shamin Jhooty, an accredited court interpreter trained (N.B. trained) in a distant part of Canada, British Columbia. The procedure in British Columbia is particularly admirable. In Sidhu, Jhooty indicated that in B.C., she had been required to pass a three-hour exam that tested her knowledge in both English and her second language (Punjabi) prior to her entrance in a 10-month college program, where she was taught simultaneous, consecutive, and sight interpretation skills through various methods of teaching including mock trial exercises. To become an accredited interpreter in Ontario, one must pass the Standard Test for Court Interpretation, which Jhooty described as being “at best . . . an aptitude test to see [if] someone has a knack for maybe transferring languages”, that required a “tourist level” of language skills in both English and the second language “No legal terminology is included in the test. Those who pass the test must take a basic one-day training workshop. Upon completion of the workshop, there is a brief written test consisting of ten questions, of which the candidate must correctly answer seven in order to become an accredited interpreter". In other words, the Test is (or was at the time of Sidhu) at Natural Translation level, and the training workshop will not of itself turn out Expert Interpreters. Hopefully they become Experts with experience. Why this wide gap between the requirements in Ontario and in British Columbia? To understand this, you have to know that the administration of the courts, except at the highest level like the Supreme Court, is the responsibility of each province in Canada. It’s not national, so there’s no national standard for court interpreting, and the Canadian provinces are notoriously jealous of their autonomy. R. v. Sidhu, 2005 CanLII 42491. Isabelle Chow, Interpreter Test Project Coordinator, Court Interpretation Unit, Ministry of the Attorney General, Toronto. Personal communication. March 2010. Vancouver Community College (Vancouver, British Columbia). Interpreting Programs. http://continuinged.vcc.ca/interpreting/. Association of Translators and Interpreters of Ontario. What is a court interpreter? http://www.atio.on.ca/info/what_is_court.asp. In my Feb. 21 post about the Winter Olympics - where, as you may have heard, my fellow Canadians walked off with the most medals - I remarked that a tremendous amount of translating and interpreting goes on unrecognized because it’s given another name or it constitutes just one part, whether explicit or implicit, of another job or function; and I mentioned the hosts and hostesses at the Games. A further example of ‘another name’ is facilitator, a new partial synonym for business laison interpreter. Now here’s another instance of ‘one part of another function’. It comes from Maryland, USA, and the context is education - in a big school system there. It’s parent liaison, or just liaison. For two years, Benjamin Santamaria helped Spanish-speaking parents and students at University Park Elementary in Hyattsville navigate the public school system… The school system is laying off administrators, instructional specialists, support staff and teachers. But the biggest chunk of those let go, about 120, are paid parent liaisons, including Santamaria. Liaisons are one way schools in the Washington region and throughout the country have sought to involve Latino immigrants, the nation's fastest-growing ethnic population, as well as parents generally. Santamaria said he engaged parents with an array of events…, in addition to interpreting and translating documents. The son of Dominican immigrants, Santamaria is fluent in Spanish and able to communicate with many of University Park's nonnative-English speakers. 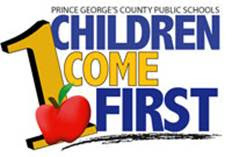 In 2006, Prince George's officials placed a liaison in each of the county's more than 200 schools [see image] in an effort to boost parental involvement. One parent told a school board, "Without the translation aid of bilingual liaisons, parents will be forced to use their children as translators to communicate with teachers." How many jobs can you think of where translating is not called translating or is a regular but secondary function? Less than three is Insignificant, more than six is Excellent. Nelson Hernandez. Latino liaisons hit hard by school cuts in Pr. George's. The Washington Post, July 8, 2009. http://www.washingtonpost.com/wp-dyn/content/article/2009/07/07/AR2009070702524.html. Megan McKeever. Potential loss of bilingual liaisons causes concern: Parents, officials make plea for help in schools. Gazette.net, March 4, 2010. http://www.gazette.net/stories/03042010/prinnew123432_32547.php. N.B. Notice the fossil of British colonialism in the name Prince George's County. But then there's another one in Maryland.